There are three main colored pencil types: wax-based, oil-based and water-soluble. Wax-Based Colored Pencils - They are the most common type on the market. The core inside the pencil casings contain pigments bound by wax. The drawings have a creamy texture as a result. However, wax-based pencils are prone to breakage and wear down quickly. They give off considerable debris and create a thin, powdery film on the surface of the artwork after the application. There are many brands of wax-based colored pencils. I recommend two common brands- Sanford Prismacolor and Derwent. 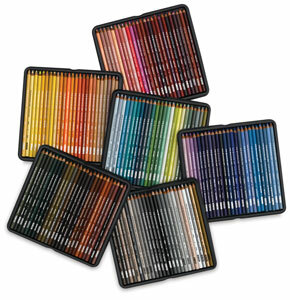 Sanford Prismacolor Pencils- They contain high wax and blend very smoothly. They are best known for their creamy and soft consistency. The drawbacks are that they require frequent sharpening, since they wear down and break easily. They also create bloom, a thin, powdery film of wax that appears on the surface after application. Under this brand there are three sub-categories- Prismacolor Premier (the artist grade category), Prismacolor Verithin, and Art Stix. Premier has the widest color range of any brand, with 132 colors in all. I highly recommend Premier for beginners. Verithin pencils have the hardest, thinnest and lowest wax content cores of any colored pencil. They are valuable for producing layouts, cleaning up edges and working for small areas. Art Stix Pencils look very much like soft pastels. You can use a blunt tip to cover large areas quickly or sharpen the end for detailed works. They are available in a range of 48 popular Premier colors. Derwent Colored Pencils have thick cores and are as soft as Prismacolors. They are slightly chalky and are available in their own range of 72 colors. Derwent Artists Pencils are moderately hard and have a slightly waxy, thick core. They come in 120 colors in a deluxe hardwood box set or in a set of 72 colors. This is another starter brand I highly recommend. Derwent Studio pencils with their hard, chalky think cores are best suited for layering. They come in the same range of 72 as the Artist and Watercolor lines. Oil-Based Pencils - As one of the common colored pencil types,Oil-Based Pencils are harder than wax-based colored pencils and do not have the dry and chalky feel of the latter. Their thick cores have a special coating that inhibits breakage and leave far less crumbs on the paper than waxed based pencils. I recommend the brand Faber-Castel Polychromos colored pencils for their high quality. Second, I would suggest you try Caran d'Ache Pablo colored pencils, if you want pencils that feel softer and creamier- more like waxed based colored pencils- than Faber-Castell brand. They come in a set of 120 colors. Lyra Rembrandt PolyColor are available in 72 colors. The consistency is a cross between a Pablo and Polychromos pencil. Water-Soluble Colored Pencils - They are another wonderful option of the colored pencil types. The strength of these colored pencils is that you can cover the paper and blend the colors, using water only as a safe solvent. 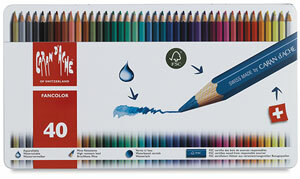 Faber-Castell Albrecht Duerer water-soluble colored pencils come in a range of 120 colors. They are the only brand in this category that completely dissolve when water is added. Caran d'Ache Supercolor II soft pencils have the same 120 color range and have the softest cores of any water soluble colored pencils. They dissolve nicely when water is added. Caran d'Ache Neocolor II resemble crayons, but are are highly pigmented wax pastels. The texture is creamy, intense, and dissolves easily. Because of their high waxy content, you can only sharpen them by hand. They are not technically colored pencils but they are accepted as such by the Colored Pencil Society of America. Lyra Rembrandt-Aquarell pencils have the same core hardness as the Lyra Polycolor oil-based line. Prismacolor Watercolor Pencils come in 36 colors that match the popular Premier colors. However, these watercolor pencils have a drier and chalkier feel. Learn the techniques that the colored pencil types can do for you here. Or take a look at the demo tutorial. Want to know how to Succeed in Art AND Business? priceless insider knowledge to help you on your way.